Coming this fall, the LONG awaited debut album from latin funk collective Brownout. The album is entitled "Homenaje' (meaning homage) and will no doubt make international noise as the real deal latin funk. Two and a half years in the making, it was recorded in rare down-time from their main project Grupo Fantasma (who recently toured as backing band to Prince!). The band hit analog tape machines, home studios and laptops to create their full length introduction to the world, chock full of Latin, afro, funk and psychedelic sounds that will challenge you to sit still without snapping your neck. Con el Brownout no se juega! 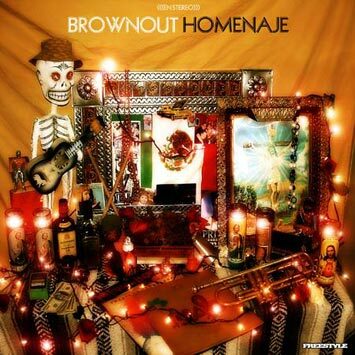 Named one of Austin, Texas' 'Best Live Acts' by the Austin Chronicle, Brownout perform the nastiest Latin funk music out today. This band of ''party rocking legends'' was resurrected from the same tequila soaked border town explosion that originated the highly acclaimed latin powerhouse Grupo Fantasma, Ocote Soul Sounds and many more getting the seal of approval from Maceo Parker (James Brown's saxophonist) and Greg Boyer (P-Funk trombonist/arranger). High praise indeed. Brownout! is an 8 piece ensemble complete with 2 guitars, bass, no nonsense latin percussion, and the 'Best Horn Section' 3 years in a row at the Austin Music Awards. Throwback but not copycat retro, their music is timeless and honest, keeping the spirit of 70s afro-latin and funk music alive while honoring their South Texas roots. Fresh off the worldwide release of their first 7'' single on the UK's prestigious Freestyle Records and a subsequent underground classic 12'' on texas label Alternate Take, the band has made waves internationally amongst dj's and tastemakers winning over fans like Quantic, Kenny 'Dope' Gonzalez and discerning music fans alike.